If I would stumble upon it before, I probably wouldn't run the tests. That's just a different tab of the same DPS calculator sheet? Could you post a couple sample scenarios with math about recovery? Whenever I tried to use bonuses as additive, I'd end up with differences vs. my expectations. The moment I used multiplicative bonuses, everything matched up perfectly. Kaylon's example of 0 recovery also wouldn't work with additive bonuses, but it does get you to 0 recovery in-game. If we consider 4-frame delay as part of "action": both speeds are equal. Damage being inflicted every 30 frames. Could you post a couple sample scenarios with math about recovery? Whenever I tried to use bonuses as additive, I'd end up with differences vs. my expectations. The moment I used multiplicative bonuses, everything matched up perfectly. That' strange. Before going to take those tests, I have search the forum a little, and stumbled upon Kaylon's and Baki's posts, both mentioning that recovery stacking is additive. I had zero doubts when observed results did match the expected ones. - all things I have tested, belong to different categories, and thus they stack additevely as he writes in p.4. But I suppose this requires further testing. Also there is one thing that puzzles me... In p4. he mentions that "Sure-Handed Ila Nocked Her Arrows with Speed", "Deleterious Alacrity of Motion" and "Gauntlets of Swiftness" do stack additevely. While in p3, it's written that they stack multiplicatively. P.S. I could make few more tests once I get home. Although I won't be able to test the things you call durgan refinements, since it seems there is no console command to enchant one's weapon. And being myself lvl 5 (on my first play-though ever, yeap ), I don't have access to enchanting yet. So it will take time. P.P.S. The reason I've went into math/optimization so early, is because.. Warchief Iklak has repeatedly handed my head to me on level 4. So I've made a conclusion that I need a stronger, min-maxed party. Kaylon's example of 0 recovery also wouldn't work with additive bonuses, but it does get you to 0 recovery in-game. Could you post a link to, or quote his example? Also I need to mention that with additive bonuses it's often easier to get to 0 recovery. Baki also noticed that in the linked post. This happens because additive stacking is usually implemented in increasing-returns manner. Unlike in multiplicative approach. I agree. With one-handed weapon, one misses +20% attack speed from "Two-Weapon Style". But... it opens the possibility to math it-out for barbarians. monks and melee ciphers. There is also a party attack-speed buff incoming for Pallegina in 3.0. And.. 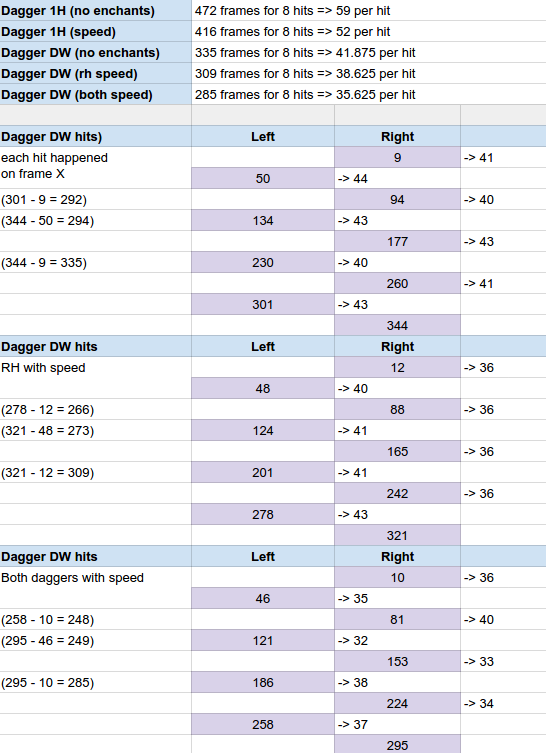 I didn't yet do the math for the straight-up +80% spd one-handed vs +100% spd dual-wield damage. What if.. suddenly it's worth it? Edited by MaxQuest, 31 January 2016 - 07:27 AM. Prior to 2.0 all items with attack speed were bugged and did nothing, you had basically only speeds from different categories which were stacking additively - that's why everyone supposed speed was additive. Also I need to mention that with additive bonuses it's often easier to get to 0 recovery. which cannot be observed in-game under these circumstances. If you want a high single-target DPS build, search the boards for my Lady of Pain. Pick the Blade of the Endless Paths version, equip her with the Gauntlets of Swing Action instead of the Gauntlets of Accuracy, and you have a 0-recovery killing machine. You may even swap Lilith's Shawl for Hiro's Mantle to get extra DR and Retaliation (as well as for looking badass); then sleep in Caed Nua for +3 PER instead of +3 DEX to make up for it. I'll put all this stuff in my next update after TWM pt. II comes out. Edited by AndreaColombo, 31 January 2016 - 11:17 AM. Heh, didn't know that speed enchants will stack. @AndreaColombo, g2g at the moment, but will take a look later. Edited by MaxQuest, 01 February 2016 - 02:54 AM. 1.2*1.15*1.15*1.33 - (0.4 - 0.15 - 0.15) = 2.01 = no recovery? Cutting it as close as possible. Edited by limaxophobiacq, 31 January 2016 - 02:11 PM. The bonus from shield is considered speed too. So it's 1.2*1.15*1.15*1.15*1.33-(0.4.-0.15)=2.18 and your barbarian can wear even plate. Noice. So you could do this with any character in Sanguine Plate as long as you can manage to get critted even though you are using a shield. How about swift aim, monk's swift strikes and cipher's 7-th level power? Hi Kaylon, can you confirm what you mean by the second paragraph here? As in, if a character is dual wielding without any other speed buffs and has two weapon style, does he get .2+.2 (for each weapon) modded to his recovery? Edited by Livegood118, 01 February 2016 - 03:13 AM. No, it means that the speed bonuses you have on your left weapon will stack with your other speed bonuses. Oh ok sorry my bad! So how does Reload Speed work? Does +50% Reload Speed mean you end up with (base/1.5) reload frames or (base*0.5) reload frames? If you have swift aim (+50%) and gunner (+20%) do you get +80% (1.5*1.2) reload speed or +70% (1.5+0.2) reload speed? Edited by limaxophobiacq, 02 February 2016 - 01:18 AM. btw is there reason not to have "attack speed" noted in game in the same fashion other mechanics are? That would end most of these debates while providing essential info to player. ^ Josh said they know how painful it is for players to calculate their DPS in this game and it is something they'd fix with high priority for a sequel. For PoE, however, this is as good as it gets. 50% reload speed means you end up with (base/1.5) and if you add gunner it will be (base/1.8 ). Edited by Kaylon, 02 February 2016 - 03:09 AM. Thanks - I also wanted to know that. What if you add DEX 20 (+30% speed) into the mix? 1.5*1.2*1.3 = 2.34 => base/2.34? Or how is the bonus from DEX calculated? So even with Swift Aim + Gunner an arquebus will still always have 108 frames reload before Dex. I love the concept of gun-rangers but bow-rangers certainly seem to be getting the better deal with their double arrows and stunlocking. Alacrity of Motioned 0-recovery bow-ranger gets 8 arrows in the time arquebus-ranger fires one shot.